They say organising a wedding is one of the most stressful things in life. Whoever they are, they have obviously never tried to stage a cricket match the following day. Having completed the marital formalities and danced Saturday night into Sunday morning, friends and family gathered at my village club for a cobbled-together 15-over thrash. 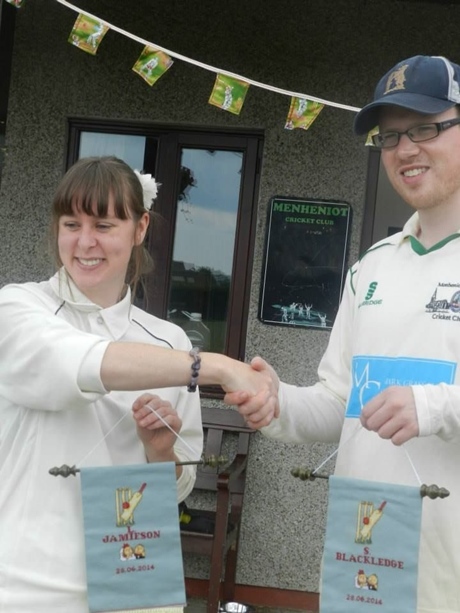 Fiercely competitive as ever, bride and groom acted as captains. At 2pm we had about 18 players between us, some willing and some cajoled, of all ages from 7 to 82. There were four ‘proper’ cricketers who we hoped might hold things together if it all threatened to go a bit Wirrall CC. Following a refreshments emergency – in the flurry of confetti and champagne the clotted cream had been left in the marital fridge – my wife won the toss and chose to bowl. I sent best man Oliver in to open with wicketkeeper Martin, as they were our only two batsmen of note. I could tell because they both had full kitbags. They even had helmets – not strictly necessary given the plastic ball. Such was the inexperience of most other players, we agreed that the umpires would turn a blind eye to wides and no-balls. A good thing too – if strict league rules had been enforced we might still be out there now. Despite the bowlers exploring what was later generously described as “an unplayable line”, we made a good start before Ollie was stumped, fishing for one which rolled down the corridor of uncertainty on the adjoining strip. Young Billy went in at three. Billy never said a word to me all day, but did everything I asked of him without complaining. Think Jimmy Anderson in an oversized helmet and without the sulky attitude. The young man’s unerring commitment to the cause was soon to prove his undoing. Fancying a bit of a hit myself, I took the captain’s prerogative and called Martin in on 39. Personal milestones have no place when victory is as stake, as my hero Michael Atherton will tell you. Graeme Hick might disagree. I managed to connect with a few agricultural hoiks, wary of my double-jointed brother’s spitting cobras and careful to keep my back foot planted with my dad ready to pounce behind the stumps. Keeping the family tradition alive, Billy drove a ball straight back to his mum Alice. Keen to get the strike, I yelled ‘yes!’, quickly followed by ‘no!’ and a lunge back to safety. But Billy had dutifully set off on the first call and we were now face to face. The perplexed lad was told he had to go, done up like a kipper by his skipper. Memories of Strauss v Hussain at Lord’s flooded back. Maybe it will be the making of the kid. 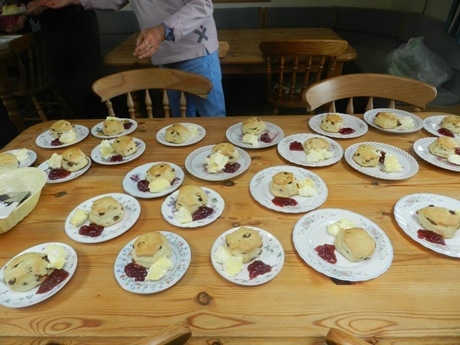 The missing clotted cream had arrived and been correctly placed between jam and scones. A more welcome sight was that of club stalwarts Zac and Tom strolling up for an afternoon net. I seized on them to bolster the line-ups for the second innings, a decision which would come back to haunt me. Our ringers were no doubt perplexed by this motley crew of odd characters. My number five batsman Kate was dressed as a dog (I still don’t know why), and several small children wandered around the square throughout, either putting themselves in funky field placings or trying to find their way back to the pavilion. Billy’s little brother Joseph fielded for a few overs before stomping off with the words ‘I don’t even like cricket!’ We all knew exactly how he felt. Tom opened the run chase with my wife’s uncle Kev, child-sized pads strapped to his hulking frame. He was soon trudging back, caught and bowled by Ollie. My dad, who played a good standard of club cricket once upon a time but now turns out just once a year, took the game away from us in a second-wicket stand with Tom. Another family anecdote was forged as I bowled a rank long hop and dad pulled it hard straight to my octogenarian grandad at backward square leg. Luckily grandma had already left, but the thought of what she would say if he returned home with a nice round bruise on his bonce awoke his reflexes. He ducked and watched the missile race away for four. I eventually got my old man, another short ball scooped to safe hands Zac on the boundary. My brother followed, caught close in, and suddenly we had a chance. I went on the attack, placing Ollie at slip. An edge went straight to him. He dropped it. I was fuming. Luckily the wedding had already happened, or I might have been looking for a new best man. They say the first rule of marriage is learning how to lose. We had been man and wife for about 24 hours, but the post-match handshake and trophy presentation felt like a sign of things to come. I’m already plotting anniversary revenge. Excellent stuff. I like that the bride is wearing white. Proper traditional, that is. On the negative side, the phrase “…the clotted cream had been left in the marital fridge,” has disturbed me a lot. Congratulations, though. I don’t suppose KC has changed from his usual routine of publishing these things ages after the event, so I guess you are past the “Honeymoon period” now, and well into the “Can you remember who bought us the ice-cream maker period“, possibly even into the “I have no idea where the wedding album is, I thought you put it somewhere period”. Congratulations on a wonderful match, Sam. The cricket and the report are pretty darn good too – well done. I do feel that grandpa might have done a bit better fielding at backward square leg – being an octogenarian is no excuse once you cross that white line. Think my favourite line of a brilliant report is “Keeping the family tradition alive, Billy drove a ball straight back to his mum Alice” A corker! Excellent reporting Sam! “…if strict league rules had been enforced we might still be out there now. ” – does this mean you’d have been there on the ground when you sent the report, or did you mean to extend the truthiness of this statement indefinitely into the future, being still true when someone in the year 4028 (incidentally the year Lalit Modi is back heading the IPL) reads this match report? The difference between the two says a lot about the quality of the bowling attack. Thanks for the kind words, gang. I’m happy to report we are still together, approaching the big four-month partnership. I daresay there will be a mid-kitchen punch of gloves before we re-mark our guards and carry on. Ah, the trientanniversary, a great day in any relationship. You need to invent a name for it, like silver wedding or ruby wedding, that morally obliges your friends and family to give you stuff. Decide what you want and call it that. The New Bat Wedding Anniversary, or the Cash Wedding Anniversary, something like that. Lovely report. Brings back memories of our family’s Boxing Day Cricket matches in Aus. In the absence of any real cricket the BBC report shows just how weak the US $ is – The company has launched claims worth more than $200m (£123) against Cuba through the International Chamber of Commerce in Paris and Canada’s Ontario Superior Court.